The Phi Mu Alpha Sinfonia Northeast Alabama Alumni Association, based in Jacksonville, Ala.
We're a group of alumni Sinfonians - brothers of Phi Mu Alpha Sinfonia Fraternity in the Alabama counties of Calhoun, Etowah, Cherokee, Cleburne, Randolph, Clay & Talladega.- coming together for music, fellowship and fraternity. Live nearby? Join us! 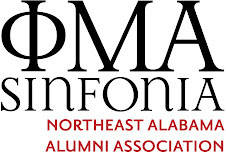 The annual meeting of the Northeast Alabama Alumni Association of Phi Mu Alpha Sinfonia will be June 2, at noon in the fellowship hall of the First Baptist Church of Jacksonville, 230 Seventh St. NE, Jacksonville, AL. A light barbecue lunch will be served. Please make your plans now to attend. Whether you have been with us since the start, haven't come out in a while, or have never attended one of our events, you are welcome. We look forward to the fraternal pleasure of your company, and we need your help. We want to do great things for music and for Sinfonia in our community, and we can't do them without you. If you have a songbook, please bring it with you. If you know other alumni Sinfonians in the area, bring them with you, too! Please visit this event's Facebook page and let us know you're coming. See you there!